Surgical treatment options are derivatives of either the inguinal approach of Ivanissevich (27) or the retroperitoneal approach of Palomo (28). Microsurgical techniques in the inguinal and subinguinal exposures require careful dissection in order to protect the spermatic artery and preserve lymphatic channels; maginification (e.g., loupes in the inguinal approach and microscope in the subinguinal approach) is mandatory (16,29). The inguinal approach identifies the spermatic vessels as they course through the inguinal canal where spermatic cord structures incorporate the cremasteric vein that may contribute to the varix pathophysiology. The spermatic and cremasteric veins are isolated and ligated while protecting the vas and spermatic artery. The inguinal approach is associated with increased postoperative pain and delay in return to full activity when compared with the subinquinal or laparoscopic techniques (30,31). The subinguinal approach requires magnification and ligation of a greater number of venous tributaries that are intimately associated with the testicular artery (32). Furthermore, multiple spermatic arteries may course through the spermatic cord at the subinguinal level making dissection more demanding (33). Doppler ultrasound can facilitate detection of number and location of spermatic arteries. The Palomo approach, e.g., ligation of the spermatic veins above the internal ring, can be performed by open or laparoscopic technique. 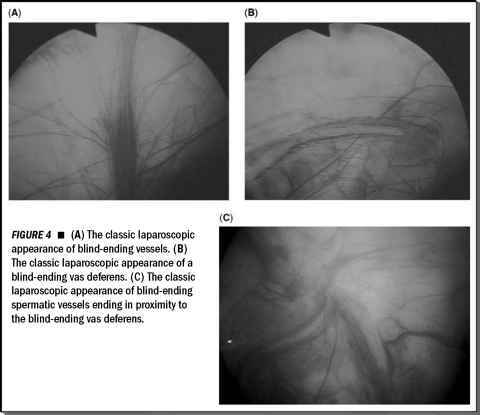 The retroperitoneal approach permits ligation of spermatic veins without the attendant risk of injuring arterial collaterals, specifically the cremasteric and deferential arteries, which join the spermatic cord at or below the internal ring. One disadvantage of this approach is the lack of access to the cremasteric vein, which, according to Enquist and Stein, will contribute to a higher recurrence rate when compared with the subinguinal approach (32,34). ■ An option in the presence of a failed inguinal/subinguinal or percutaneous embolization approach or in patients who have had previous inguinal hernia repair (36).